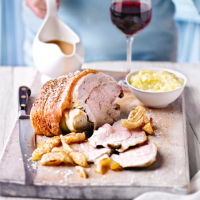 Waitrose free range, easy-carve pork leg is pre-scored and boneless so it is ready to cook and easy to serve. Unwrap the pork, cover loosely with kitchen paper or foil and leave in the fridge for at least 4 hours, or for up to 24 hours. Preheat the oven to 220ºC, gas mark 7. Immediately before cooking, dry the pork rind thoroughly with kitchen paper then brush or rub with the oil. Sprinkle with the salt and rub it into the skin. Place the meat onto a rack over a roasting tin and cook for 20 minutes then reduce the heat to 190ºC, gas mark 5 for 30 minutes per 450g or until thoroughly cooked. Remove from the oven and transfer to a warm carving plate or board and leave to rest while you make the gravy. To make the gravy, drain the fat from the roasting tin, reserving the meat juices. Whisk in the flour and cook over a medium heat for 1 minute until thick. Whisk in the stock and cider then simmer, whisking throughout, for 2-3 minutes or until the gravy thickens. Season to taste and serve immediately with the roast pork, some roast root vegetables, and apple sauce. To carve, remove the crackling and carve the joint into slices and serve the crackling separately or, if you prefer, carve the pork through the scored slices to include the crackling. Phillip Schofield's perfect match: The interesting mix of sharp and rich flavours in the pasta go brilliantly well with the velvety fruitiness of Terra Viva Organic Merlot IGT Delle Venezie. This wine is a real find. A warming juicy red would be ideal here: Valdivieso Winemaker Reserva Malbec 2010 Central Valley, Chile.